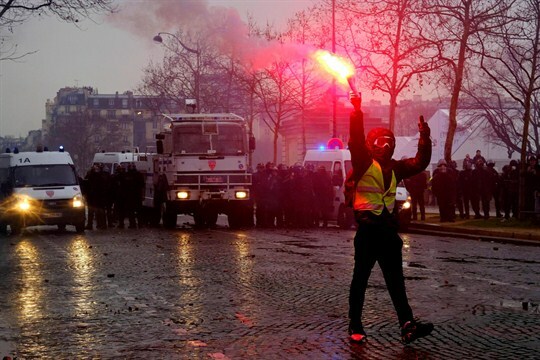 Yellow Vest protesters clash with French riot police near the Hotel des Invalides in Paris, Dec. 1, 2018 (Sipa photo via AP Images). French author Michel Houellebecq, whose latest novel “Serotonin” was released earlier this month to widespread acclaim, has acquired the reputation of being something of a prophet. This is mainly because his previous effort, “Submission,” which envisioned an Islamicized France circa 2022, was released on the day of the Charlie Hebdo attacks in January 2015. Another of his novels, “Platform,” which culminated with an Islamist terrorist attack on a tourist resort, was published a week before Sept. 11, 2001.